Ben 10: Ultimate Alien – Cosmic Destruction is a video game based on Ben 10: Ultimate Alien and is the fifth game in the Ben 10 video games series. 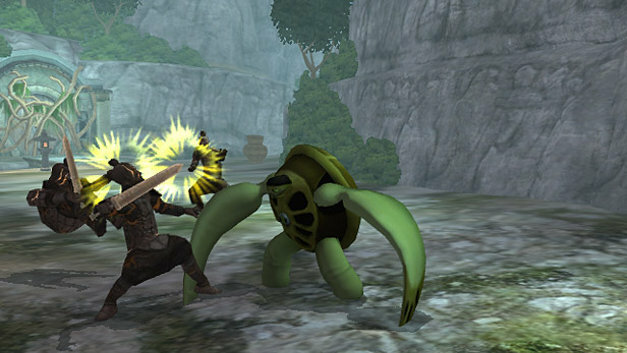 The game was panned by reviews, being criticized by its limited length, game mechanics, as well as several gameplay and design concepts. Ben 10 Ultimate Alien: Cosmic Destruction is the new game that introduces the new alien heroes: Water Hazard, Armodrillo, AmpFibian, Terraspin and NRG from the Ben 10: Ultimate Alien television series, allowing players to tunnel or beat through evil alien enemies, unleash water blasts, emit radiation beams, shoot electricity bolts and fire, wind attacks, and more, with a unique experience system which lets them upgrade alien attributes and abilities. The game also provides all-new game enhancements such as Quick Switch, which allows players to switch alien forms faster than ever, and Quick Time Events which creates a cinematic experience that guides players through fierce boss battles and challenging puzzle elements. Players will control Ben and up to 16 alien heroes including Ultimate Big Chill, Ultimate Spidermonkey, Ultimate Echo Echo, Ultimate Swampfire, Ultimate Humungousaur, Four Arms (PS3) and Rath (Xbox 360). Ben, Gwen and Kevin are fighting a group of Forever Knights in a catacomb in Rome. 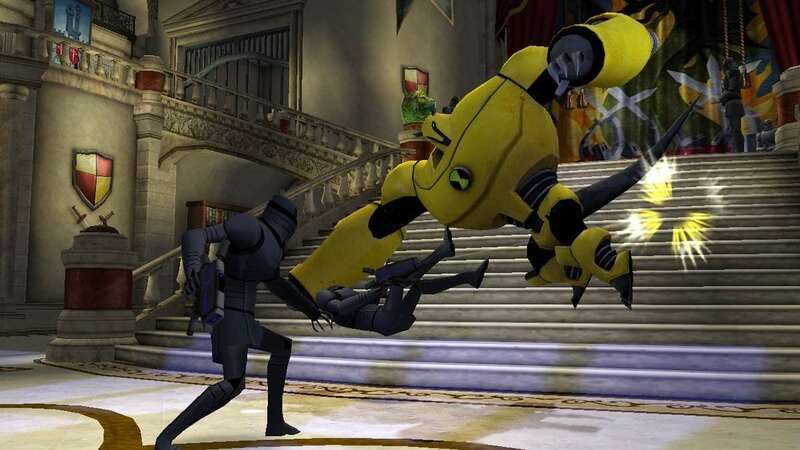 Ben tries to transform to help Gwen and Kevin fight the Forever Knights, but Jimmy Jones keeps trying to call Ben about something. Eventually, Ben gets separated from Gwen and Kevin, and begins trying to find his way out of the catacombs. Ben runs into Vulkanus and his pick-axe minions, who seem to be searching for something. After defeating the pick-ax minions as Ultimate Humungousaur and defeating Vulkanus, Ben continues trying to get out of the catacombs, and eventually runs into his old foe, Enoch, who has become empowered by an alien artifact. After defeating Enoch, Ben takes the artifact away from Enoch and the result is Enoch transformed into a stone statue, then Ben throws the artifact on the ground. Ben is then picked up by Gwen and Kevin, and when Jimmy calls him again, Jimmy tells Ben about a cosmic storm advancing towards Earth. Ben calls some Plumber ships and tells them to get to the cosmic storm and investigate it. The Plumber ships approach the cosmic storm, but a powerful blast destroys them. 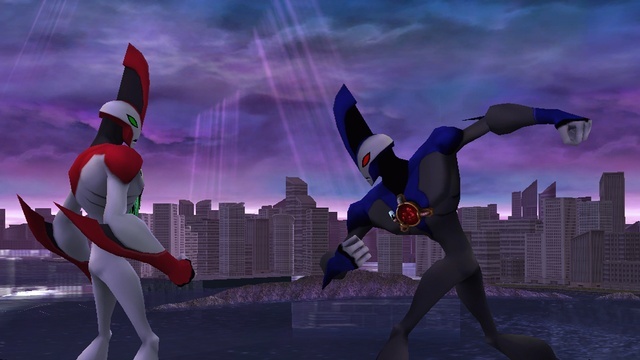 Meanwhile, Ben, Gwen, and Kevin see Null Void creatures attacking France. The group goes to France to stop them. At a Forever Knight museum, Ben finds the Vreedle Brothers who are trying to steal an alien artifact. After defeating them, Sunder arrives and steals the artifact. Ben then chases Sunder for the artifact, stopping to watch a Will Harangue broadcast where Harangue is showing battle footage of Ben in Italy and France from an anonymous source. After Sunder tries to kill Ben in a burning building, Ben chases Sunder to the Eiffel Tower, Sunder is frustrated at Ben that he has once again gotten in his way, where he saves some people from Sunder's attacks, and defeats Sunder using Ultimate Swampfire, gets the piece, and escapes as the flaming Eiffel Tower collapses. Inside the Rust Bucket 3, Azmuth arrives and explains that a hostile To'kustar is coming to Earth to destroy Ben, he informs him that an ancient Galvan weapon is hidden on earth in pieces, called the Potis Altiare. If combined with the Ultimatrix it could give Ben the power to defeat the evil To'kustar. Much to his shock he discovers that Ben already has a piece of the Potis Altiare, the artifact Sunder and the others were after. They also realize that the artifact Enoch was using was also a Potis Altiare piece, but reasoning that Ben already defeated all the bad guys in that area they focus on finding more pieces. The To’kustar is destroying a planet with a cosmic ray, and it is revealed that Psyphon (Vilgax’s old servant) is working for the To’kustar. Psyphon is talking with the To’kustar, saying that he works for the strongest, and was even considering working for Aggregor, but Aggregor preferred to work alone. As the To’kustar was about to destroy Psyphon, he explains that his Robot Extermination Devices (R.E.Ds) will only answer to his command and the To’kustar must allow Psyphon to live so his R.E.Ds can find the rest of the Potis Altiare. The To’kustar orders Psyphon to activate the R.E.Ds, and he does so. The group soon detects high alien activity in the Devil’s Tower at Wyoming. Azmuth suspects it to be an interference with the Potis Altiare, and leaves the group so they can collect the piece. Ben finds Kraab—after fighting off some R.E.Ds as Ultimate Spidermonkey—who also seems to be trying to find the Potis Altiare piece and chases him. Ben defeats Kraab and runs into a robot who helps him get to the end of a military base in Devil’s Tower. Ben soon encounters Sevenseven (who attempted to crush him with giant boulders earlier), and fights and defeats Sevenseven, then takes the Potis Altiare piece. On a video screen, the To’kustar and Psyphon watch Ben fight Psyphon’s R.E.Ds, which greatly angers the To’kustar and he begins smashing asteroids and even destroying part of a larger asteroid. Gwen is magically using the two fragments of the Potis Altiare to find the others. She is suddenly overwhelmed by the vast power of the artifact while having a vision of a dragon attacking her at the same time attacks Ben and Kevin; as her eyes glow pink. Kevin manages to free Gwen from the artifact’s power by taking the pieces. Gwen says she has detected the next piece in the Great Wall of China. Ben goes there and fights an army of Terracotta warriors. Ben is found by a Terracotta General and defeats him with Ultimate Big Chill. As Ben continues going off to find the piece, he encounters the same dragon Gwen saw in her vision. Ben defeats the dragon and manages to collect the piece. After Ben defeats the dragon, he gets blown into the air, where Gwen and Kevin catch him unconscious. The To’kustar is once again disappointed by Psyphon’s failure to prevent Ben from getting another Potis Altiare piece. But Psyphon is able to prevent his attempted demise by saying he sent his R.E.D.s to kidnap one of Ben’s most trusted allies and put him/her under the To’kustar’s control. Ben receives a transmission from Cooper stating he is under attack, and to come to Tokyo alone. Ben reaches Tokyo and begins searching for Cooper. Ben encounters Zombozo, who refuses to tell where Cooper is, so Ben transforms into Ultimate Spidermonkey to fight him. He then defeats Zombozo and goes off to find Cooper. Eventually, Cooper is found, but he has become an evil, wired security system enhanced by a piece of the Potis Altiare. Ben defeats Cooper and frees him from the R.E.D.s' control, but had to destroy the Potis Altiare piece in the process. Meanwhile, the cosmic storm has approached Earth, and damages the Plumber station on the Moon. Reading her miniature spellbook, Gwen teleports Cooper back to Bellwood to get all the Plumber’s helpers in the fight against the evil To’kustar. Ben is visited by the Ancient Galvan, who give him a map for the rest of the pieces of the Potis Altiare. They detect another piece in the Amazon Rainforest, which is being held in a military base. While Ben is looking for the artifact, he unintentionally activates a missile. Ben works to stop the missile from launching, and after succeeding in doing so, he quickly escapes the base before it could self-destruct. However, in an elevator, Ben meets a pair of clones of the Vreedle Brothers after fighting off the R.E.D.s as Ultimate Echo Echo. Ben fights them and takes the Potis Altiare piece after defeating them. Ben is watching another Will Harangue broadcast, where his anonymous source is still feeding him footage of Ben’s “rampage” around the world, while also saying that Ben is bringing the end of the world with footage of the cosmic storm. Ben thinks Jimmy Jones is putting footage of Ben on the internet, and Will Harangue is collecting it to feed his campaign against Ben. Psyphon appears on the video screen giving Ben a message that the To’kustar will come to Earth and he will be the first to fall. He also tells Ben to surrender the Potis Altiare. When wondering how Psyphon knew of the existence of the Potis Altiare, Ben thinks a Galvan could have told him. Azmuth appears saying the Galvan would die than tell their secrets. The cosmic storm has already arrived, and since there is still only one piece of the Potis Altiare, Ben has to get back to Rome in order to retrieve the artifact. When he remembers that the Omnitrix teleported them to the planet Primus, Azmuth then sets the Ultimatrix to reach the last piece of the Potis Altiare, and drags Ben along with it. When Ben arrives at the coliseum where he fought Enoch, he finds Overlord, where he reveals he was the one who leaked the footage to Will Harangue as revenge against Ben. He also has the Potis Altiare piece, so Ben chases him for it. Ben meets Overlord, he gets furious at him that he has one-upped him once again. After defeating Overlord, he passes out and the Potis Altiare piece is dropped into the sewers. When Ben goes in to retrieve it, he finds Psyphon grabbing it and running away with it. Ben chases Psyphon and escapes a room filled with bombs, then destroys Psyphon’s ship, and finally fights and defeats Psyphon. As Ben was about to actually finish Psyphon, he escapes with the cosmic storm, and the To’kustar finally arrives, demanding that Ben bring the Potis Altiare to him or else earth will be destroyed. Gwen and Kevin come to pick Ben up, where he now has all the pieces of the Potis Altiare (except for the one he destroyed in Tokyo during his fight with Cooper) and seems determined to fight the To’kustar to save the Earth. Ben goes to Japan to take down the To’kustar. While Ben tracks down the To’kustar, he rescues citizens and destroys the rest of the R.E.Ds. When Ben finds the To’kustar, Ben becomes a full-sized Humungousaur to fight, but the To’kustar easily defeats him and tosses Ben into the ocean. The Ultimatrix has the pieces of the Potis Altiare attached to it, and Ben becomes Way Big to become equal with the To’kustar. After defeating Evil Way Big he uses his powerful cosmic ray attack with the Potis Altiare. Jimmy then tells him about the new Sumo Slammers 3D movie. Evil Way Big, who is revealed to be Albedo, falls on the moon and eventually gets hit by Lu.